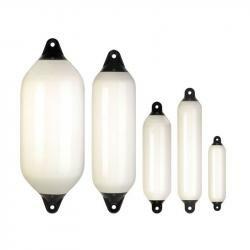 Buy boat fenders online | Buoys for sale | Fenders and accessories. 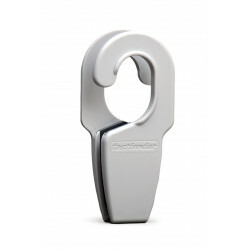 For large vessels, Dan-Fender balloon fender rope hold, are imbued with a stainless steel eye insert. 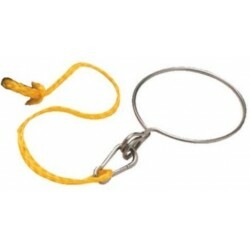 This makes the rope hold even stronger and more pressure resistant. 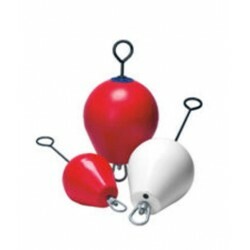 To match the extreme pressures from large cruisers and vessels, the largest balloon fenders have a specialised heavy duty valvesystem.Standard colours: Red &amp; white,Optional colours: Black, blue &amp; yellow (On request). 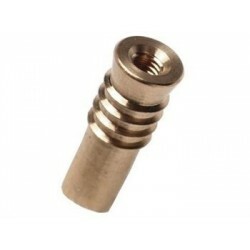 Competitive prices compared to quality have made this product popular worlwide. Remember to use the lower eye when you moor your boat to a mooring buoy. Thus the boat will always keep in contact with the anchor. 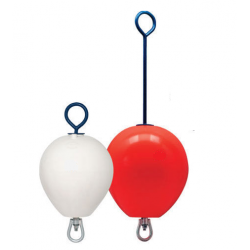 The upper eye is only intended for lifting of buoy and double safeguarding. 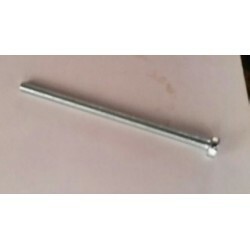 Do not use stainless steel together with galvanized iron, as it will start galvanic corrosion, causing very quick breakdown / rusting through of the lower eye and the chain. Important! Standard colour: Red &amp; white. Optional colours: Black, blue &amp; yellow. New unique multifunction design allowing you several different use-options with just one product..! As standard the multi dock fender is delivered as a long-side fender, but it can very simply be converted into a corner-fender (up to 90&deg; bend, both for inside or outside corner protection). As an option the integration of a centrally mounted Dan-Fender (14.02.0001) for extra vertical protection is possible. 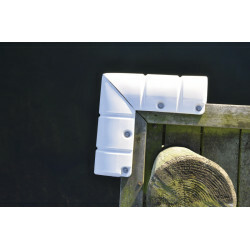 This is ideal for protection of the swim platform when berthing against floating pontoons, but also ideal for long side quays where the tide changes the water level or when different sizes of yachts dock against the quays. A brilliant and innovative product for multiple use options. Unique new multifunction &ldquo;mini&rdquo; dock fender which is based on the same innovative design as the &ldquo;big brother&rdquo; the multidock fender. The mini multi dock fender can almost be mounted everywhere on the quay, pontoon, pontoon fingers&hellip;etc, and the unique design allows you very easily to convert the standard long-side fender into a corner fender (up to 90&deg; bend, both for inside or outside corner protection). 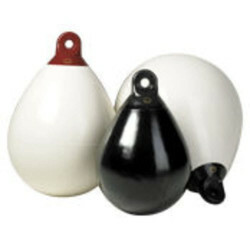 In principle intended for the same use as ordinary, inflatable mooring buoys, but in stead of being made of soft PVC, this is a buoy of hard polyethylene, which has subsequently been filled with PUR foam. Consequently, it cannot immediately sink. Remember to use the lower eye when you moor your boat to a mooring buoy. Thus the boat will always keep in contact with the anchor. The upper eye is only intended for lift of buoy and double safeguarding. Do not use stainless steel together with galvanized iron, as it will start a galvanic corrosion, causing very quick breakdown / rusting through of the lower eye and the chain. As we all know, Its simply not humanly possible to untie, adjust and knot fender lines to useful height quickly. As a result seconds before docking it becomes race against time and eventually many boaters resort to fending off with their hands and feet. This can result in serious injury and of course the boat can also get damaged when fenders are not placed properly. Quick &amp; easy fender adjustment is essential for effective fender use.Only the finest materials are used to make the Fendergrip. Two types of UV protected DuPont Derlin are used, one is glass-filled for durability in high stress areas. To counter corrosion, stainless steel hardware is used exclusively. Each Fendergrip is hand assembled, inspected and tested before packaging. Fendergrip gives you instant push button fender height adjustment plus a positive lock. Makes fender adjustments a breeze yet installs in seconds to cleats, grab handles, and rails of any size. 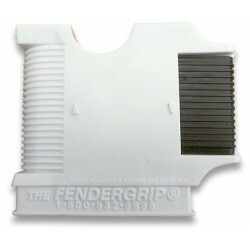 The Fendergrip uses your 3/8&rdquo; to 1/2&rdquo; line&rsquo;s strength to hold fenders of all sizes. Made of rugged DuPont Delrin&reg; and stainless steel hardware. Used by the U.S. Coast Guard , Marine Police Agencies, and the Cigarette&reg; Racing Team. Stores securely atop the fender. Made in the U.S.A. 3-year limited warranty. 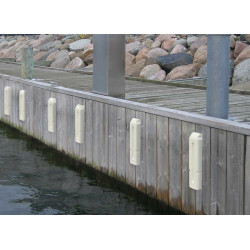 Connects to bow railings, life lines, cleats or hand rails. The Fastfender is resistant to tractive forces of up to 181 kg. Available colours white &amp; blue. 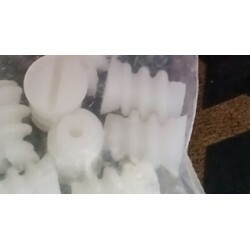 Material: Nylon PA6. Resistant to sea water and UV rays. Will not scratch or damage the railing. 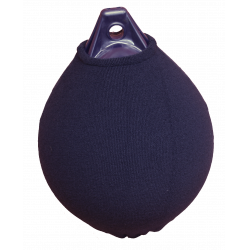 Fendress fender covers are made in France, by hand, using premium quality resistance, non abrasive loop knit acrylic. Resistant to UV light and sea water. Protects your gel-coat, paint, fenders, from marks and abrasion. Enhances the appearance. Makes your fenders last longer. Machine washable. Fastfenders are designed to lift heavy fenders and for rough use. 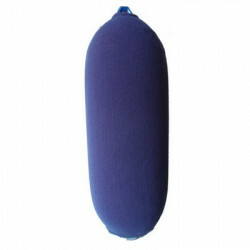 It is made&nbsp;of a carbon-based material which is very light weight but extremely strong to carry 181 kg of weight. 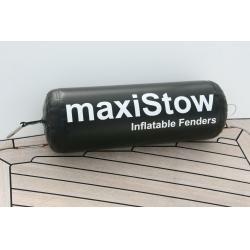 Fastfenders make it easy for you to attach and remove the fenders to your boats railings, steel wires as well as on roof railings and other kinds of&nbsp;handrails. Fender heights can be adjusted very quickly and easily in a few seconds. It is so easy to use Fastfender that anyone can hang the fenders using Fastfender. The Fastfender is resistant to tractive forces of up to 181 kg. Available colours white &amp; blue. Material: Nylon PA6. Resistant to sea water and UV rays. Will not scratch or damage the railing.